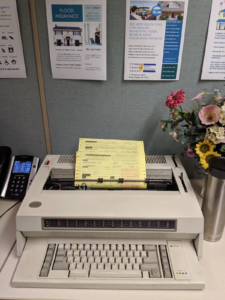 Having been working in insurance for over 30 years, I can recall the days of using carbon paper and typewriters. Back when I started, rating auto policies was done manually, with limited rating factors. Nowadays, rates are done through the computer using algorithms and it’s almost impossible to determine one’s rate. Rates are driven in a large part by credit, prior coverage history together with tickets, accidents and other claims going back as far as 5 years. Some companies even charge more for claims involving personal injury regardless of whose fault the accident was. Interestingly, over all those years, the Assigned Risk really hasn’t changed it’s rating structure. The Assigned Risk is a state’s auto program that is designed to write people that have trouble getting insurance. Although I haven’t used the AR for years, I am beginning to now find that the AR or NYAIP can be a good fit in certain circumstances. This is because the AR does not base a rate on one’s credit or on having prior coverage. Furthermore, only tickets and at fault accidents, going back just 39 months, are rated. Not at fault accidents, hit and run accidents and no seat belt tickets are not rated. The AR also does not begin charging for a ticket or an accident until it is at least 3 months old. Knowing the ins and outs of the Assigned Risk aka the New York Auto Insurance Plan has come in very useful.